What are the Key Benefits of Contract Management Software? A clear line of sight of all your contract documents and arrangements enables you to identify wasted spend and area for consolidation. By reducing the amount of time spent on admin you free up people within your business to focus on other areas that add value. For instance, legal teams can spend more time on activity that requires their expertise rather than basic administration, which doesn’t. Every business contract can bring with it some level of risk, whether it be legislative, financial or supply chain. By increasing visibility and helping to quantify those risks, Gatekeeper helps to manage compliance and reduces the chance of any kind of failure or penalty. Research shows that an average 50% of negotiated savings are never realised after a contract is signed. This is because of a lack of monitoring and oversight. Gatekeeper keeps you on track. What Kinds of Businesses Need Contract Management Software? Start-ups and fast-growing organisations wanting to apply rigour to their processes and stabilise themselves for further growth. Mature organisations requiring consolidation and clear visibility over their contract universe. Businesses in heavily regulated sectors such as healthcare and finance. Forward-thinking companies looking to solve critical business issues with technology. 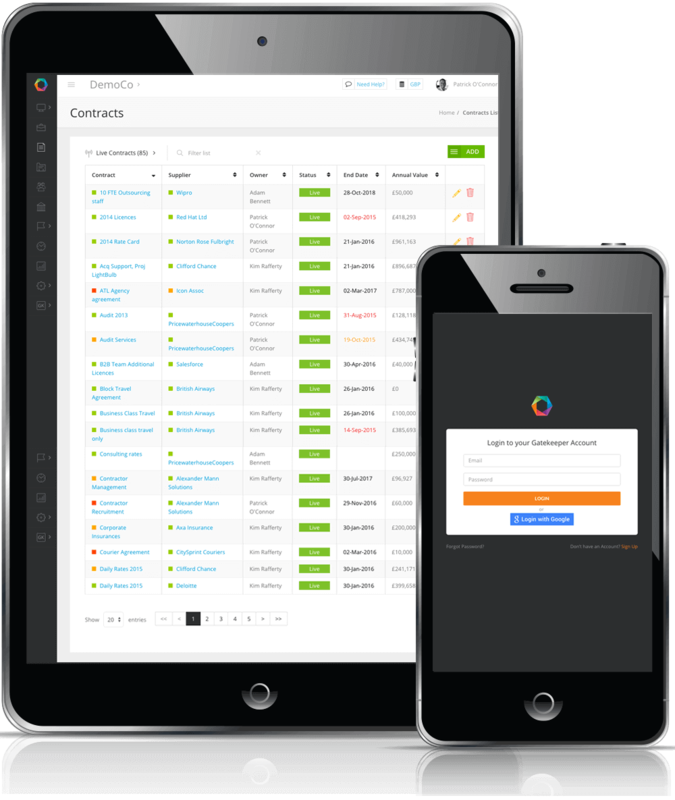 Gatekeeper allows you to centrally store and manage all of your contract and supplier information in the cloud. All in one place - Company wide. 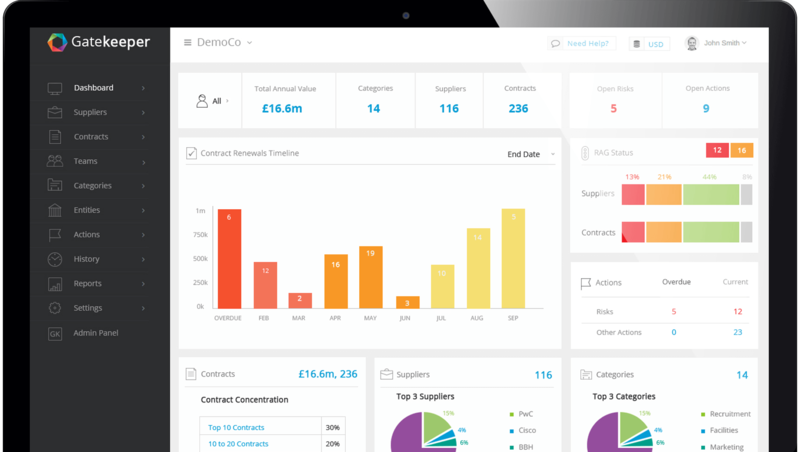 At a high level, contract management software helps businesses save time, reduce costs and minimise their business risks. By providing full visibility over your contract database, automation tools to remove manual work and the ability to monitor and track contract performance, contract management software unlocks the full value of your agreements. It's estimated that poor contract management costs businesses an average of just over 9% of annual revenue. How would an extra 9% look on your business's annual revenue? What customers do you have in my sector? You can see some of our customers here, including some video testimonials. We work with businesses across most sectors, including Financial Services, Healthcare, Technology and Non-Profit. What parts of the Contract Lifecycle does Gatekeeper cover? Gatekeeper helps manage all stages of the contract lifecycle, from inception, through sign-off to renewal and closeout. Automation and digital workflows help to take the manual work out of contract generation, approval processes and performance management freeing up your teams to intervene only as required. Have a look at how our eNegotiate, eSign and Kanban Workflow features work to optimise your contract lifecycle processes. How long does it take to implement Gatekeeper? This will vary depending on your current contract management process, the number of contracts you have and the resource you can commit to the implementation phase. We have a specialist onboarding and implementation team to help you get up and running, with experience across a wide variety of businesses. With Gatekeeper being cloud-based, you'll have access immediately to begin adding your data and generating insights. Implementation takes anywhere from 4-12 weeks, depending on your plan and progress. Wherever you need it to be. Gatekeeper uses Amazon Web Services, with five global instances to respect your data sovereignty requirements. Choose to host you data in one of two US instances or in Europe, Asia or Australia. Find out more on our Enterprise Page.